Sugarbea And Her Colours: Snow Day! I have great news to share and I can't wait! The new winter /holiday collection from Stacey Yacula ~ Snow Day, is now available! From now till 10 November the complete collection of Snow Day (22 stamps altogether) will be on a sale price of USD90.00 and that's a whopping savings of more than 30%! 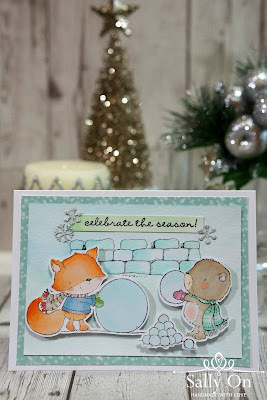 To celebrate the release of the new collection, I'm sharing with you a new card I made using 4 stamps from the Snow Day! The sentiment ~ Celebrate the Season! is from the previous collection, Winter Wishes Sentiments set. I have used Copic markers for Rupert, Wilson and Snowballs. The background with Snow Fort scene was finished off with a light wash of watercolours. For this card, I tried to keep the colours light and Christmas~y. It was real fun and joy to colour all the new images, especially Rupert! I had a lot of fun blending the orange tones to his fur. I hope you like the card that I've shared today! In fact this is the first Christmas card I made for this year! More to come, I promise! 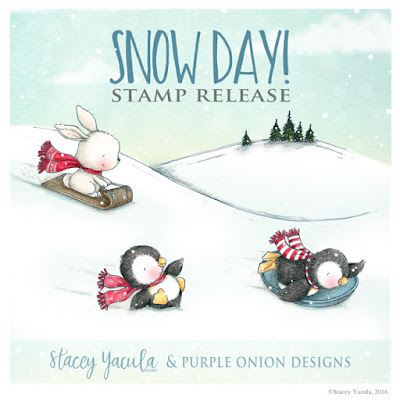 Please do check all the super adorable images from the new collection Snow Day from Purple Onion Designs website and blog for more inspiration and awesome creations from the Design Team. I'll be sharing a couple of new cards using stamps from Snow Day the next few days so please do swing by if you like what to see more! Stay calm and make more cards! Are You Ready For Holiday Sale? Be Merry Be Jolly ~ Falalalalala!